I chose the book called Salmon Creek by Annette LeBox & Karen Reczuch, which received the B.C.Book Prize for illustrated Children’s Literature. Where she could hear the wind, the creek stones, and her salmon mother singing. Sumi swam down the river, past factories, farms, forests, tugboats, and docks until she came to a place where the river met the sea. The infinite sea was her new home where she became a mature fish. And then one summer something changed. She started missing her birthplace, so she set out for her birth creek. She came back to her birth creek to lay her eggs. Exhausted Sumi looked at the sky, she could hear the wind, the creek stones, and as she drifted downstream, Sumi sang to her eggs, just like her mother’s done when Sumi was just an egg. This book tells a wonderful story about the life cycle of Coho Salmon. It is filled with beautiful images and metaphors. I was attracted to this book because I saw the connection that I could make between this book and teaching a Science class about life cycles or protection of Salmon and their habitat. This book can also be used in an Ecology class. The story can be a good starting point for a discussion about Pacific Salmon who are in danger because too many of them are being caught. 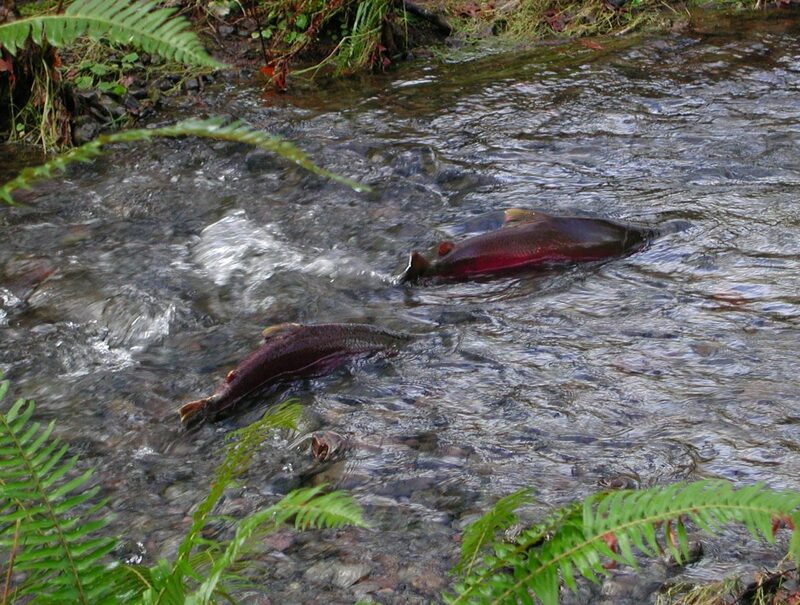 Only a small percentage of salmon live to reach their natal stream or spawning grounds. Since salmon do not feed once they leave the ocean, some will die on their way lacking stored body fat to make the whole trip. And all that marine nitrogen the dead salmon flesh bring back to the rainforest makes the land so much more fecund and, in turn, the plants around salmon streams provide shelter for the baby salmon. They truly have a mutually beneficial relationship. It’s amazing really, almost like the forest knows what it’s doing. This sounds like a great book and very applicable to the classes you mentioned. What age range (for a children’s book) do you think it would be good for, I’m wondering if I should add it to our collection at home. I’m always looking for more science-based and relevant books for my kids to read. Thanks for the review!